Cloud computing and virtualization are here to stay. Businesses are embracing these innovative technologies, which offer a combination of flexibility, scalability and low cost that’s ideal for meeting today’s IT needs. But they also present a unique set of challenges in deploying and maintaining them as a part of the IT infrastructure – in particular as they focus on business critical applications. Challenges regarding security and high availability, as well as management hesitation, can lead to delayed or limited deployment of cloud computing and virtualization. And other adjustments need to be made, such as revisions to disaster recovery plans. This session will discuss the current state of virtualization and hybrid clouds in data centers throughout the world. 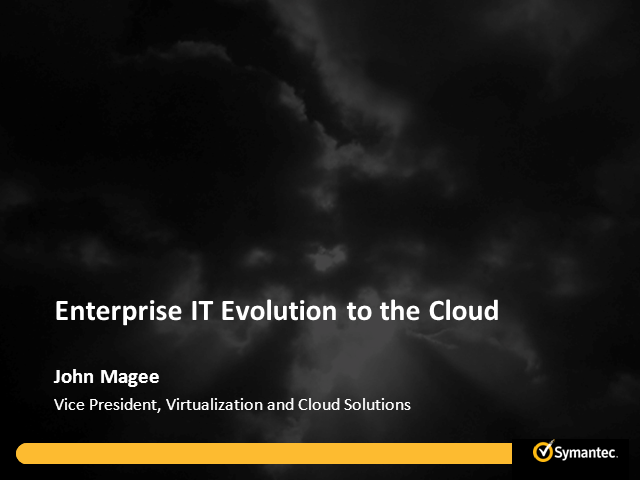 We will address the benefits and challenges inherent in a cloud-based IT infrastructure, using the results of Symantec’s recent Enterprise IT Journey to the Cloud Survey, which polled 3,700 professionals in 35 countries.